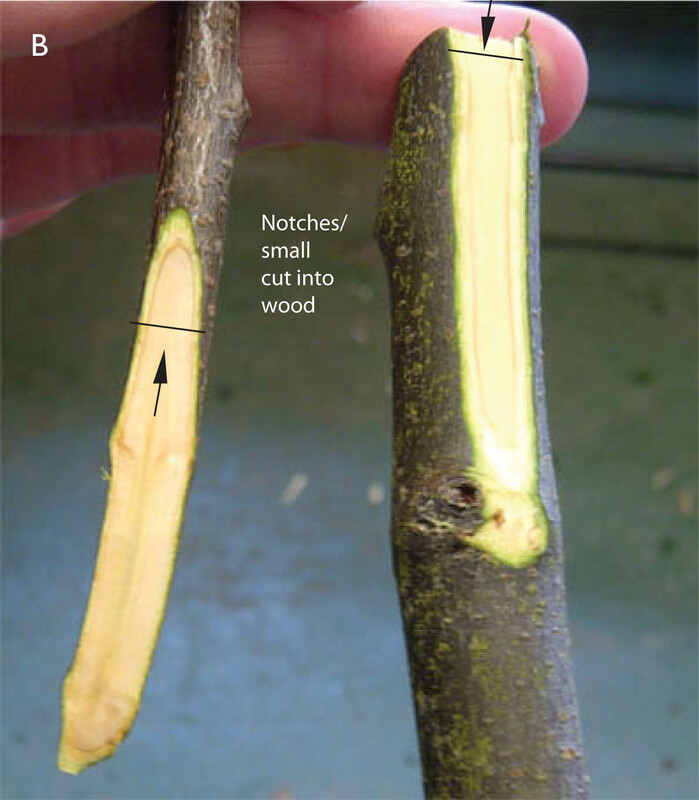 After attending another session on Grafting Techniques, not the ‘hard work’ graft, but the ‘joining of two pieces of wood to create a new tree’ graft, I have decided to write a blog about it. The process has always intrigued me and after my first attempts at grafting last year, when all four miraculously took, I developed the grafting bug. At first the process seems complicated, but it soon falls into place once you start practicing the cuts and understand the science a bit. So, in an attempt to hopefully demystify grafting I am going to take you through the steps. 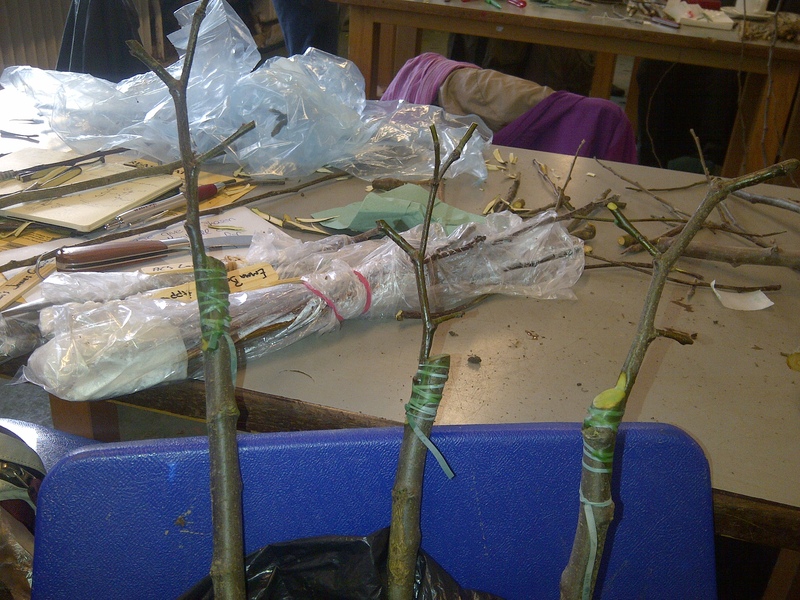 There are different types of grafting techniques but here I am just going to cover the crudely named ‘whip and tongue’ technique as this seems to be the most popular for fruit tree grafts. 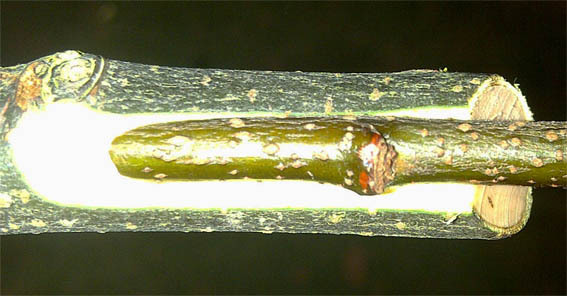 To create a graft you need two pieces of plant tissue that are related, ideally in the same genus or at least family group; a rootstock [which determines the tree’s size] and a scion [which determines the fruit variety]. Scions are taken from trees in the dormant season around December up to February. Select one-year-old wood, ideally pencil-thick, and cut to around 10 to 15cm long with four to six buds visible. Put these in a plastic bag, roll up and sneak them into the bottom of your fridge for safe keeping. The grafting procedure is then carried out towards the end of February until the end of March, just as the sap starts to rise. The rootstock is a little more complicated. It is important to select the right rootstock for the space you have available for the tree to grow…and there are many to choose from. Frank Matthews has a good guide to the different rootstocks; MM106 and M26 semi dwarfing rootstocks tend to be the most popular for apples in gardens. Rootstocks will need to be bought in and can be purchased online via Blackmoor or Ashridge Nurseries. The science behind grafting is fascinating and for those of you who have done the RHS General memories of plant biology will come flooding back. It all comes down to the cambium tissue that lies just beneath the bark and its ability to actively divide and reproduce cells [also called meristematic]. When two separate [but related] pieces of plant tissue are joined together, it is the matching up of the cambiums on the scion and rootstock to “intimately contact” each other that will make the union successful; as the two separate cambiums will fuse together. Locating the cambium is relatively easy as we know it is just under the surface of the bark. We just need to make sure that the cut on each piece of wood is similar in width and length. 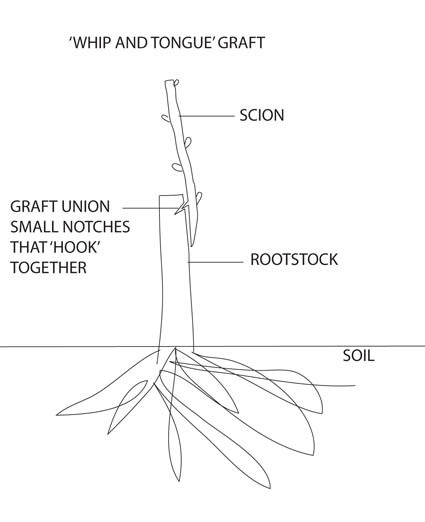 Ideally choose a rootstock that has the same size girth as the scion. However, you may have thin scions that are impossible to match up in girth size to a rootstock; this always seems to happen to me. As long as you make sure one side of the cambium [on the scion and rootstock] is matched up and in “intimate contact” the union process will still occur. Tools. A good grafting knife that is clean and sharp is essential and a sharpening stone to keep it that way would be useful. 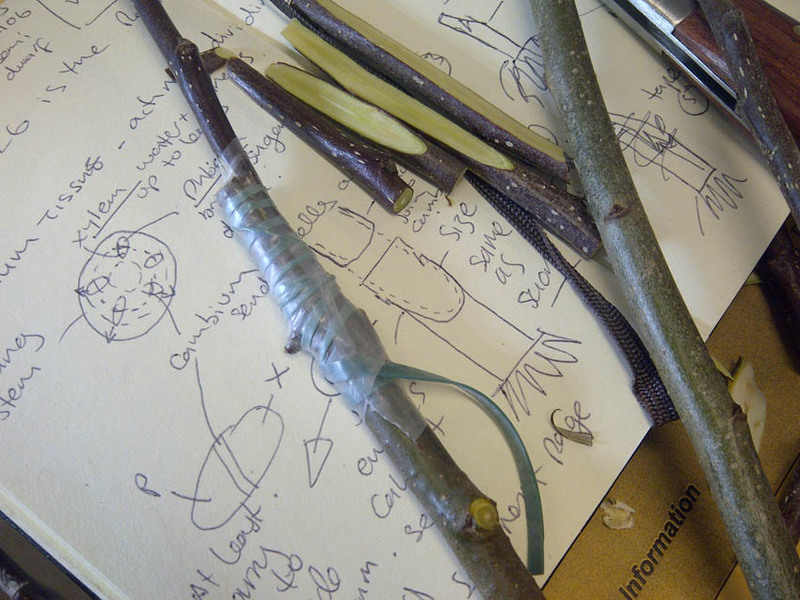 You will also need secateurs, elastic rubber to bind the two stems together and some grafting tape [some people use heated wax] to wrap around the secured join to protect from infection and lock in moisture. See Blackmoor for supplies. Oh, and a first aid kit would be wise. So for the cuts. 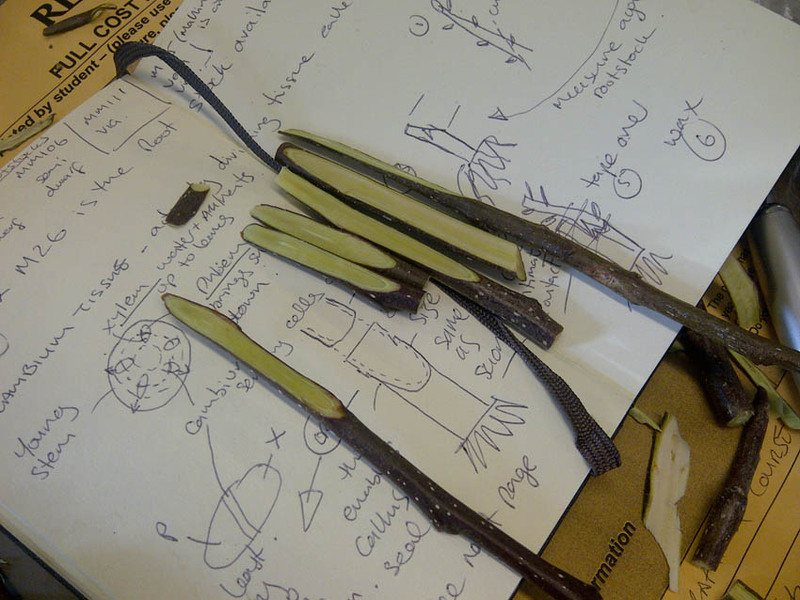 Starting with the scion… the aim is to make a smooth diagonal cut from one side of the stem right through to the other. Practice this as much as you can until you are happy with the cut [see my practice cuts below]. The tutor of the grafting course at Reaseheath, Harry Delaney, advises keeping your elbows tight to your side to help keep control of your knife and cuts. Some prefer to make cuts away from the body but Harry teaches cutting towards…hence the tight elbows…and the first aid kit. Once you are happy with your practice cuts on your scion you need to make sure that a bud is present on the back of the cut side as in my practice cut below [see top diagram too]. Next, make a small, straight notch in the wood [in image scion is on the left, rootstock on the right]. This will slot into another notch that you will make on the rootstock and will form the union [helping to keep the pieces together]. For the rootstock, cut just above a bud [diagonal cut sloping away from the bud] to leave you with about 15cm for the stem height; you are also aiming for a bud to be present at the back of the cut on this too. You cut the rootstock differently to the scion as you don’t need to cut from one side of the stem through to the other. You just need to take the surface off to reveal the cambium. 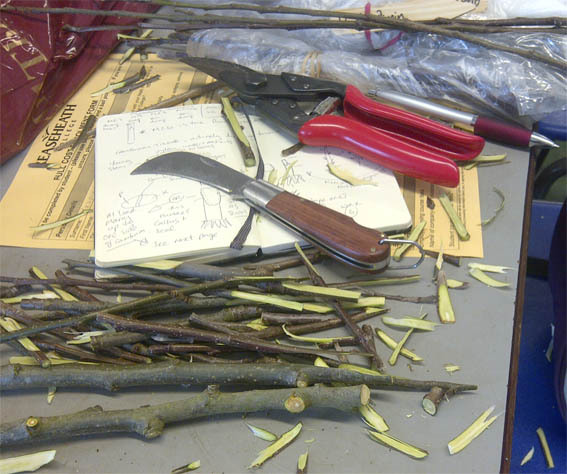 It is also good practice to measure your cut length on the scion against the rootstock, to get a good match. You are aiming for a little gap or ‘church window’ at the top of the join [left image] as well as the bottom [right image]. Once you are happy with the cut, which should be as smooth and as straight as possible, check that the two pieces of wood fit together with no gaps between the two surfaces. Now line up the cambiums, whether matching to both sides or just one [as in above right image] making sure the notches [graft union] are ‘hooked’ together [see diagram at top] and fasten the elastic tightly around the join and tie. You now need to stretch and mould the grafting tape around the join or dab with melted wax. That’s it. Label with the variety and rootstock and you are ready to plant up. By April, if the cambium union has worked you should see the buds starting to burst. Very exciting. I shall be holding my breath for my grafts; three Quice ‘Vranja’ on rootstock Quince C [below] and one Apple Norfolk Beefing on M26.